I get interviewed on websites occasionally. I should probably have a thread collecting those. 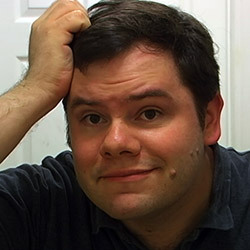 In May 2012, I spoke with Nathan Withrow of "Flights, Tights, and Movie Nights" about my 2007-2008 film Shamelessly She-Hulk, as well as The Thief and the Cobbler and my work in general. In September 2014, Nathan asked me back to talk about The Thief and the Cobbler: Recobbled Cut on his FilmWhys podcast. In May 2005, I spoke with Brad Cook of MacObserver about Deleted Magic. In June 2012 I spoke to Wes Fenlon of the Mythbusters website Tested.com about The Thief and the Cobbler, and my work on the Recobbled Cut. In June 2006 I spoke with Cartoon Brew's Amid Amidi about The Thief and the Cobbler: Recobbled Cut. In 2012 I was doing a lot of fanart for the My Little Pony: Friendship is Magic series, and got to know that community very well. A few interviews resulted. In December 2012 I spoke to Everfree Network’s Cutie Art Crusaders show, joining RainbowPlasma and Bernd for over an hour. In January 2012, I was interviewed by Gendid of Equestria Daily. In January 2012 I was interviewed by Everfree Radio (at about 35 minutes in). I spoke to Final Draft and Skipsy. At BroNYCon, January 2012, I appeared on the artist's panel featuring John Joseco, Pixelkitties, and Egophiliac. 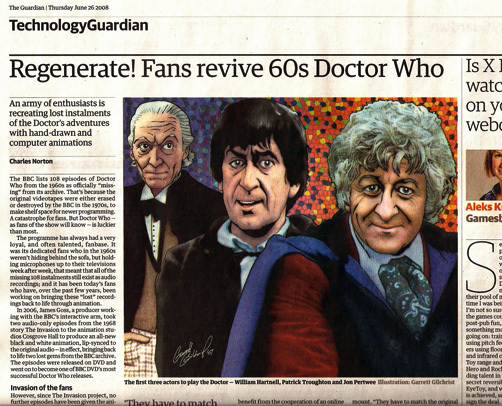 In June 2008 I was featured in an article by Charles Norton for UK newspaper The Guardian about my work animating lost episodes of Doctor Who for WhoSprites. The project was also featured in SFX Magazine, Doctor Who Magazine, and the WIRED Magazine Blog. And various recent articles about Star Wars Deleted Magic. So Patton Oswalt and Clark Gregg just tweeted a clip from our She-Hulk movie. Saying it was an Agents of SHIELD spoiler. That happened. Come to think of it, our Spider-man/Bruce Banner has been on Agents of SHIELD 5 times doing stunts. The AgentsofSHIELD account says: "You guys need to recreate this." My art was featured toward the end of this post, which was part of the Today's News section on Deviantart today (saturday, Feb 21). Two of my Bonzo Dog restorations featured in this article. (Three, if you count the link to "Death Cab For Cutie.") Sure, why not.